Hello, and welcome to MotOPPO GP, the definitive blog-based Grand Prix motorcycle racing game. 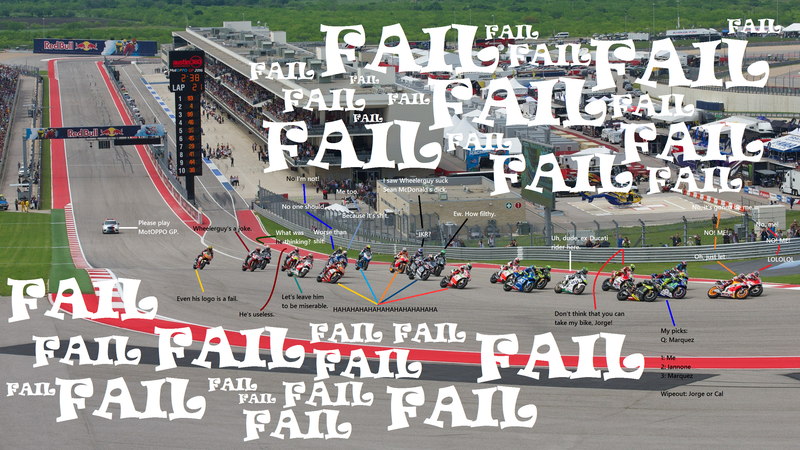 Or, as those riders say, the biggest failure in Oppo history. I’m just beyond sad and disappointed, because almost nobody played. The halls are empty, cold, silent, and flies are everywhere. Unpopular is not enough to describe how big a failure the last round is. I don’t know, really. I’m just dejected at this point. The only hope I have is if this gets shared and I ask Marc Marquez to indulge me and play & promote this game. And that’s impossible. The rules can be found below, but for simplicity, consult the quote box after the link. You have until just before the first qualifying session to make picks. The MotoGP race at COTA will begin Sunday, 10 April. Final plea: come here and play this game, all of you, somebody, anybody.